The American Indians lived in teepees for more than a century. They were then used as a place of meditation, a summer residence or rooms for guests, and what a joy for the children to play in! Considered by architects as one of the best ventilated and ecological housing systems, our 4 teepees with character cottage *** (kitchen, 2 bathrooms and sanitary facilities, wifi, TV, ... fully equipped) and our 2 tipis eco are used in the summer where you can enjoy memorable moments whilst being able to move around the interior standing up. 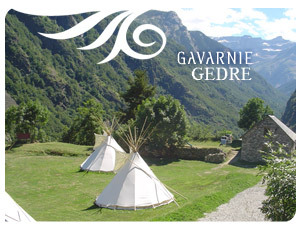 You are in the Hautes-Pyrénées, at Gèdre - Gavarnie, facing the Cirque de Gavarnie, at 1300m altitude in one our indian teepees suitable for 4 to 6 people.